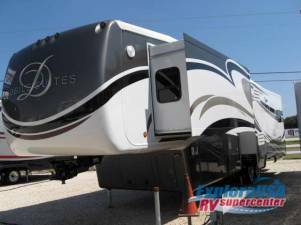 Mobile Suites Fifth Wheel w/Rear Living Area Including Sofa w/End Tables & Overhead Cabinet, Sofa & Dinette w/Chairs Slide, Kitchen Island w/Dbl. Sink, Power Lift TV w/Overhead Storage/Cabinet/Range w/Conv. Oven and Refrig. Slide, Pantry, Entry Closet, Step Up to Side Aisle Bath w/Corner Shower or Tub, Linen Cabinet, Toilet, Sink w/Med. Cabinet, Front King Bed Slide w/Nightstand, Wardrobe/Washer/Dryer, Vanity w/Drawers w/TV & Storage, Front Wardrobe & More! Avail. Options May Include: Fireplace.